JOHNSTOWN, PA, August 26, 2014—Zacharich Adkins, a participant in Goodwill of the Southern Alleghenies.’s Out-of-School Youth Employment Program, was named “Outstanding Summer Participant” for Cambria County by the Southern Alleghenies Workforce Investment Board (SAWIB) at the board’s August meeting in Hollidaysburg. Goodwill provides career services at the PA CareerLink®, Cambria County, which are made possible through the support of the SAWIB, the region’s leader and active partner in workforce development efforts. Services include Career Development, Paid Work Experiences, Basic Education Remediation, and WorkKeys Certification. Adkins sought assistance from Goodwill to earn his GED and to obtain employment. He enrolled in GED classes at the Greater Johnstown Career and Technology Center and was accepted into Goodwill Industries’ 8-week summer work program, working at the Richland Goodwill for vocational training. Summer employment opportunities in either the public or private sector are subsidized for up to 35 hours per week in which the youth earns minimum wage while learning job skills. When possible, placement of youth at a work site reflects a career interest area and where work maturity and occupational skills can be developed. All youth are rated on the Work-Readiness Assessment to evaluate outcome of the youth performance at the work site. In August, Adkins passed all four sections of the GED Exam, three of them with honors. 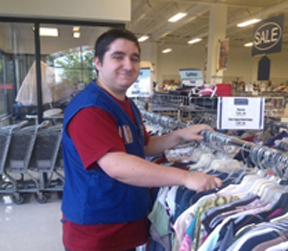 On his Work-Readiness Assessment, he received the highest scores possible in all areas for his performance at the Richland Goodwill store. Goodwill Industries hired Adkins as a part-time Sales Associate for the Richland Goodwill and he began on August 11. Goodwill Industries via the PA CareerLink is assisting Adkins with his pursuit of postsecondary education. Adkins was one of six Outstanding Summer Participants recognized by SAWIB from the six participating counties of Bedford, Blair, Cambria, Fulton, Huntingdon, and Somerset. For more information about Goodwill’s Youth Employment Services, contact Nancy Peck, Senior Program Manager at (814) 533-2493, ext. 264 or npeck@goodwilljohnstown.org.